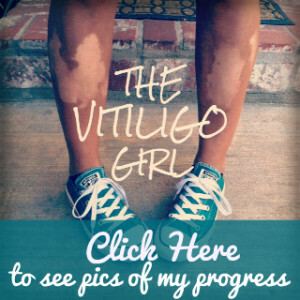 Today I wanted to continue my review of Vitiligo Miracle and talk about chapters 1 and 2. Chapter 1 starts off with a short introduction that validates the feelings many of us with vitiligo have. I can relate to much of what he says here. He then gives an overview of what you will find in his book, and he talks specifically about his 5 step system to “cure” vitiligo. This was what I was most interested in – and the main reason I bought the book. I think his five step system is very thorough and encompasses much of what I have been doing to get my pigment back. Although one of them I have not incorporated yet. He lists each step and briefly explains why it is so important. As I read through each step, I see a few things right away that I already knew, but also a few things I am interested in learning more about. After that, he then tells his vitiligo story which I found very interesting to read. He does tell his story on the sales page where you purchase the eBook. But he gets a little more detailed here. I enjoyed reading his story. In fact, I enjoy hearing anyone’s story on how their vitiligo started – mostly because I love hearing about other people’s lives (I guess I’m sorta nosy) – but also I like to compare similarities and differences. I think it’s very important to hear what triggered vitiligo in other people because it can be a clue as to what might have triggered your own. Anyways, back to the book! So he tells his story, and then ends the chapter by assuring us that there is something we can do about our vitiligo. Pretty nice start. Chapter two is entitled “More than You Probably Wanted to Know About Vitiligo”…and I have to say that I do agree with this statement because I am not really interested in all of the little details about vitiligo – I just want to get rid of it already! LOL J But in all seriousness, it is good to know these things because the more informed you are, the better you can help yourself. He starts by telling us what vitiligo is, which is a bit redundant since all of us who have it are well aware of what it is. However, he does talk about the process in which the body makes skin pigment. I think this is very important to understand because it highlights the complexity of skin pigment – a fact that makes interruption of skin pigment quite easy. For me, this reinforced the fact that there is something that can be done about vitiligo, since it is very much an, INTERNAL issue. I know for myself, this is very encouraging. Another thing I liked is that he has a bullet point list here of the different types of vitiligo, so you can quickly figure out which type you have. He next gets into the causes of vitiligo – and he lists five here. 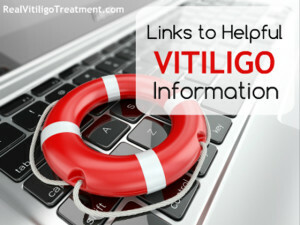 He also points out that sometimes it’s hard to pinpoint the exact cause of vitiligo – which is why it’s important to develop a treatment plan that addresses all five causes of vitiligo in order to heal. Makes sense. The next section talks about who is most at risk for developing vitiligo. Under the subheading “Other Health Issues”, he lists other health conditions that often coexist with vitiligo. I recall someone asking about one of the conditions listed on the vitiligo Facebook group recently – so it is interesting to see that it is actually related. Under the subheading “The Psychological Factor” he talks about the devastating effects vitiligo can have on a person, and how this leads to more stress and can worsen vitiligo. He then lists five helpful ways to help you alleviate stress. I think suggestion number three is one of the most important, as many of us do not have this. Under the heading “How Your Immune System Affects Vitiligo”, he mentions that more than half of all vitiligo patients suffer from two issues – and that one of these things specifically inhibits your body’s ability to make melanin. Interesting. The last section of chapter two goes into glandular health and how it relates to vitiligo. He lists two glands here that need to be monitored closely when vitiligo is present. One of them Dr. Wanakee Hill mentions in her book. But the other, I didn’t know about. Good to know. So there you have it! A breakdown review of chapters 1 and 2 of David Paltrow’s Vitiligo Miracle. The next two chapters will cover the signs and symptoms of vitiligo and conventional treatments and consequences associated with them, so stay tuned for that! Hi, I’m loving this blog. Thank you so much for writing – when I read your story it echoed my own. Something I’d like to point out is the use of language. Whenever I catch myself using ‘my’ whichever autoimmune dysfunction I’m about to reference – I catch myself and change the language. It’s not mine. It’s taken up temporary residence. It is absolutely 100% curable. I find it astounding how many people refer to any “disorder” as theirs. I understand that we need a sense of belonging however with all the naysayer docs out there, I believe we need to create messages of empowerment through health! Good way of looking at things! Thanks for visiting :)! Glad you found me.